As finalists, Team Hummingbuzz receives a $20,000 prize. If they prevail in the October 2019 finals, the team will qualify for the $2 million prize. More than 600 Innovators from 30+ countries across six continents submitted designs for the first phase of the competition. Those designs were evaluated by a team of 97 industry experts with more than a millennium of combined professional experience. "We educate our students so that their work can stand the test of real-world evaluation," said AE Chair Vigor Yang. "Nevertheless, this is a success that we could not take for granted. We are very proud." 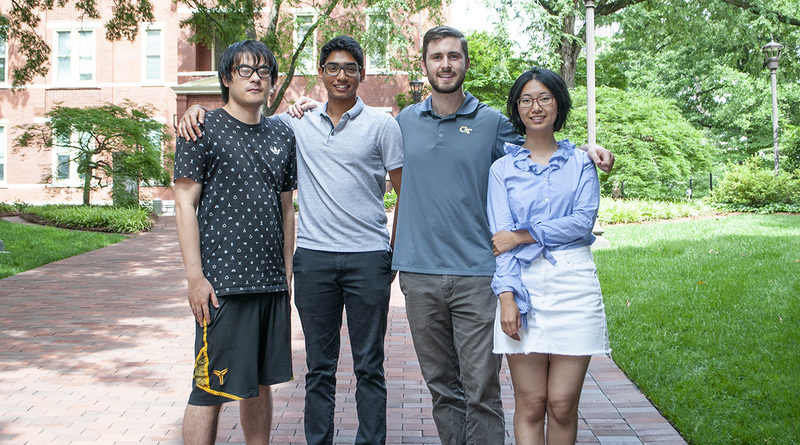 Working together for two full semesters to design Hummingbuzz was a broad base of Georgia Tech undergrad and grad students: Yuanxin (Adam) Shen (AE), Shuyi (Suzie) Wang (ISYE), Brian Eberle (ME), Alistair Sequeira (AE). The effort was headed up by AE professor Daniel Schrage, with mentoring from his colleagues Prof. Marilyn Smith and Prof. J.V.R. Prasad, and AE research engineers Apinut Sirirojvisuth, and Sylvester V. Ashok. Phase I of the competition tasked the engineers with developing a safe, quiet, ultra-compact, near vertical take-off and landing (VTOL) personal flying device capable of flying 20 miles while carrying a single person. Although the requirements were tough, and the hours were long, the teams' passion for rotorcraft helped them prevail. Sequeria had to quickly learn new and advanced noise software to successfully conduct the preliminary computational fluid dynamics (CFD) and noise simulations, which ultimately lead the team to execute on the winning design. "I convinced myself to believe that nothing would stop me from achieving the information required for the GoFly project," said Sequeria. "So after many tries with the software, I was able to extract the noise readings for our concept." Phase II will consist of developing a prototype that can successfully perform at a minimum: vertical, or near-vertical, takeoff, followed by steady flight-out-of-ground effect, an aborted landing, and a vertical or near-vertical landing. Phase II finalist will be announced March 2019. The Team's student leader, Shen, knows it won't be an easy task to compete in the next phase. "I think the most challenging thing for Phase II will be bringing it from conceptual design to prototype. To complete a project like this we will need to not only recruit the best and most talent engineers to continue our designs, but they will need to have passion for rotorcraft and the belief that this is the future."